PALO ALTO — Palo Alto Buddhist Temple is presenting a special gala event, a two-hour concert by Hiroshima, the pioneering Asian American jazz fusion group, along with Hawaii-based taiko master Kenny Endo, on Saturday, Sept. 29, from 6 to 10:30 p.m. The event, which will also feature a reception with Hiroshima band members and a VIP sushi and sake tasting by renowned chef Alan Hirahara, a graduate of the California Culinary Academy, will be held at the Schultz Cultural Arts Hall at the Jewish Community Center, 3921 Fabian Way, Palo Alto. Side dishes, beverages and desserts will be available and cocktail attire is advised. A limited number of tickets will be available for $150. For those interested in attending the concert only, the event will run from 8:30 to 10:30 p.m. and tickets cost $50. For tickets and more information, email [email protected] or call (888) 816-4065. 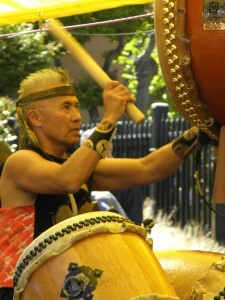 Endo is one of the leading personas in contemporary percussion and rhythm. He is the vanguard of the taiko genre, continuing to pave new paths in this Japanese-style drumming after more than 30 years as a taiko player. A performer, composer and teacher, he has been honored with numerous awards and accolades. Proceeds from the event will go to Palo Alto Buddhist Temple’s 100th anniversary and to the Buddhist Churches of America Japan Relief Fund.